The emergence of global navigation satellite systems, combined with the evolution of GPS, introduces new possibilities for the use of GNSS in aviation. A major gain in integrity, accuracy, and availability can be expected by using multiple GNSSes and augmented services. The path from algorithm development to the derivation of standards for use in aviation is both enduring and widely distributed among various institutional stakeholders. International and national space and aviation agencies, such as the European Space Agency (ESA), the Deutsches Zentrum für Luft- und Raumfahrt (DLR, the German Aerospace Center), and their counterparts in regions outside Europe contribute to the development of new techniques. In this two-part series, we will describe the goals and some results of this joint project, including the integration of GNSS and inertial technologies, antenna beamforming techniques and equipment design, spoofing detection and signal authentication, monitoring the Galileo system, and multi-constellation receiver autonomous integrity monitoring. The UniTaS IV Project investigates technologies and methods to improve the practical use of satellite navigation in aviation. Hence integrity, continuity, and availability of navigation aids are a major focus of the project. 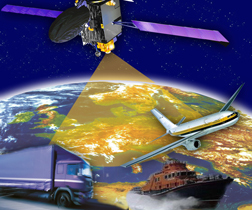 Key elements in the current evolution of the navigation technologies employed in the project include the ground-based augmentation system (GBAS), hybrid navigation using micro-electromechanical system (MEMS) inertial navigation sensors, use of Europe’s Galileo system in aviation and associated safety-of-life requirements, and antenna beamforming techniques for GNSS navigation. We investigate the engineering aspects of the foregoing topics beginning with the theoretical background and followed by the results of proof-of-concept demonstrations. Several demonstrations have been developed during our project using one or more of these technologies to characterize their practical use. A team of academic and industrial partners led by the Institute of Flight Guidance (IFF) of the Technical University Braunschweig carried out the work on UniTaS IV. Our academic partners are the University of the Federal Armed Forces, Munich (University FAF Munich), the DLR Institute of Communication and Navigation (IKN), and the Institute for Navigation at Stuttgart University. Our industrial partners include Fraunhofer IIS, iMAR GmbH, Funkwerk Avionics, and messWERK GmbH. The algorithms developed during the UniTaS IV project were field tested, in most cases including flight trials using a DO 128-6 research aircraft shown in the photo on the opening page. GBAS is designed to support precision approach operations at airports within a coverage area defined by a nominal range of 23 nautical miles. It provides desired flight path information for approaches, landings, and other maneuvers within the terminal area, as well as determining ranging source errors using multiple ground reference receivers. Information on those errors is broadcasted via VHF data broadcast (VDB) to the users in the coverage area. The GBAS ground station also monitors the integrity of the GNSS signals-in-space. High precision landing operations, such as Category II and III approaches, have very stringent integrity and continuity requirements. Without the availability of Galileo or the new GPS L5 frequency, single-frequency GNSS user equipment requires additional augmentation for GBAS equivalent approaches up to CAT IIIb (GBAS Approach Service Type D, GAST D). Minimum Aviation System Performance Standards (MASPS) for GPS Local Area Augmentation System Airborne (LAAS) Equipment (RTCA Do-253C) requires several additional integrity augmentations. These augmentations include position solutions with various smoothing time constants, e.g., dual solution ionospheric gradient monitoring (DSIGM), fault detection before and during new satellite additions, satellite geometry screening, and optional on-board autonomous integrity monitoring. In the course of the UniTaS IV project, an integrated GBAS/INS system was developed that uses the INS to help meet the Category II and III requirements. Such GPS/INS hybridizations are well known in the technical literature and demonstrated in practical applications. In these cases, inertial navigation systems (INS) use the basic principle of measuring a vehicle’s accelerations, which can be integrated to velocity and position. In contrast to the long-term stable (but noisy) GNSS position solution, the INS solution only provides short-term accuracy. The complementary nature of these two systems is widely recognized. A GNSS landing system (GLS) can benefit from the hybridization of GBAS with INS in two ways. First, the inertial information can be used to coast for a short time during GNSS signal outages, which may occur for some ranging sources due to shadowing by aircraft’s wing or fin, or as a result of a signal-in-space being excluded from a position solution if a fault is detected. Second, the inertial information can be used to increase the ability of the system to detect and exclude ranging sources that are disturbed locally and thus cannot be detected by the GBAS ground station. Because signals from the navigation satellites arrive at the user receiver with extremely low power density, GNSS-based equipment is inherently vulnerable to the radio frequency interference (RFI). Due to the spread spectrum technology used by GNSS, some RFI robustness is provided by the de-spreading processing gain. However, this can easily become inadequate in case of strong interference. Of particularly great concern is the RFI problem in GNSS applications with safety-critical aspects, such as aircraft landing with GBAS. The UniTaS IV project addressed the RFI challenge by using adaptive antennas. These are based on the same principle as phased-array antennas: the individual outputs of each array element are weighted and summed in order to produce a desired array radiation/reception pattern. The array weights are adaptively adjusted by a dedicated weight control mechanism for providing an optimum signal reception according to some criterion. The signal-processing software running on the host PC of the PXI chassis is basically a software receiver that implements all typical GNSS signal-processing functions after the PRN code correlation. The signal processing includes signal tracking by using code and carrier loops, navigation data decoding, and position determination. For processing the signals from the antenna array, the software receiver also has blocks that implement the various algorithms used for adaptive array weight control and estimation of DOAs. The calculated array weights are applied in each receiver channel, and the beamformer output feeds into the tracking loops. We investigated the behavior of IMUs under high dynamic conditions using a double-equipped MEMS IMU that included two complete and dissimilar sensor sets of accelerometers and gyros, respectively. An additional MEMS was used for reference. In order to ensure very high dynamic excitation of the IMUs, the trials employed an aerobatic aircraft equipped with a GPS receiver and a flight measurement computer with which to record data. This first part of the article has shown techniques that are being evaluated or will be evaluated during real flight trial as part of the UniTaS IV project. The second part will concentrate ground based activities on theoretic investigations concerning aspects of the new GALILEO signals and multi-constellation GNSS. As part of this forthcoming discussion, we will also present a short overview of the the aviationGATE Galileo test infrastructure for airborne and apron applications, built as part of the UniTaS IV project. The results presented here were developed during the IFF’s UniTaS IV project founded by the Bundesministerium für Wirtschaft und Technologie (BMWi) and administered by the Agency of Aeronautics of the DLR in Bonn (FKZ 50 NA 0734). The IFF wants to thank all UniTaS IV scientific and industrial partners for the good cooperation and the excellent work performed during the UniTaS IV projects. M. V. T. Heckler, W. Elmarissi, L. A. Greda, M. Cuntz, and A. Dreher, “Narrow-band microstrip antenna array for a robust receiver for navigation applications”, 3rd European Conference on Antennas and Propagation (EuCAP 2009), Berlin, Germany, Mar. 2009, pp. 1206-1210. M. Cuntz, L. A. Greda, M. Heckler, A. Konovaltsev, M. Meurer, L. Kurz, G. Kappen, and T. G. Noll, “Architecture of a real-time safety of life receiver”, Proc. of the 2009 ION International Technical Meeting, Savannah GA, USA, Sep. 2009. A. Konovaltsev, F. Antreich, A. Hornbostel (2007), “Performance assessment of antenna array algorithms for multipath and interferers mitigation”, Proc. of 2nd Workshop on GNSS Signals & Signal Processing (GNSS SIGNALS’2007), 24-25 April 2007, Noordwijk, the Netherlands.